ECS is excited to offer a new resource for students: A Career Prep ‘Course’ in Canvas! 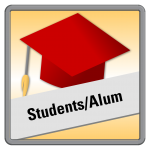 In it you will find exclusive best practices, tools, & examples specifically designed to help ISU engineering students. Please note that this is NOT an actual class: you are not required to do any assignments and no grades will be assigned. Our 2017-2018 Annual Report is now available. View statistics and information about career advising, on-campus recruiting activities, and more! Iowa Economic Development Authority (IEDA) is now accepting Fall 2018, Spring 2019, and Summer 2019 applications for their Iowa Student Internship Program (https://www.iowaeconomicdevelopment.com/Business/student) and STEM Internship Program (https://www.iowaeconomicdevelopment.com/Business/stem). Recent ISU alum and former career fair co-chair, Sarah Huber, utilized networking opportunities to start her career at Tesla. Engineering students had the chance to network, seek internships and co-ops and learn about full-time employment opportunities. Find a summary of student and employer services, along with next-destination results for the year’s graduates. Also included is an overview of the year’s career fairs, on-campus interviewing, career outcomes, employers, and more! Junior in aerospace engineering, Rami Shoukih, leads a team of students in building a nanosatellite aimed to map near-Earth objects including asteroids.